Does torture work, does it produce actionable information? Some experts contend that it does, some say it does not. 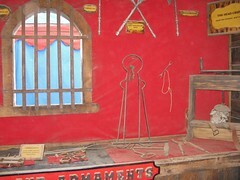 Those who say it does not work contend that better information can be obtained by kindness than by torture and pain. Who should we believe? I think that most of us would trust the answer from the group of experts that supports our preconceived ideas. Certainly I have no desire to torture nor would I want to be tortured. Only a few Americans, that I am aware of, have been tortured. John McCain is one such person, and he opposes torture. In the final analysis, I believe that it boils down to how we want to be identified as a nation. Do we want to be on a list of those who don’t torture, or do we want to be on the list of history’s villains who did torture: like Saddam’s Iraq, Stalin’s USSR, Hitler’s Germany, Mubarak‘s Egypt, Mao’s China, Zia’s Pakistan, the Spanish Inquisition and so forth. It does come down to morality in the end. And is the US an exceptional nation or are we not? 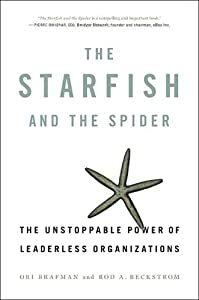 The authors divide organizations into two types, those that are centralized with a head directing a body like a spider and those that are decentralized with no head directing a body like a starfish. Cut a starfish into pieces and each piece will grow into a new individual; cut a spider’s head off and the spider will die. Why is this so important? It is important because those who oppose Occupy Wall Street will look for a leader or a central group to capture or discredit as they did in Wikileaks. When there is no center, there is no easy way to combat the idea(s) that OWS is advancing. In the decentralized model, each attack on the idea makes it stronger by attracting more supporters. Thus we use the strength of the opposition to OWS against them. By the time the opponents of OWS figure it out, it will likely be too late for their side, the 1% and their supporters. There is a downside to the good news though. Al-Qaeda also uses the decentralized model. In the words of the authors, bin Laden was a catalyst who sparked the movement and stepped back to let others form cells and act on their own. That is in contrast to Saddam Hussein who was the head of a centralized organization, a spider, where capturing or killing the head could lead to victory. There are ways to defeat a starfish, and I will leave that for a future post. I am optimistic that we will defeat al-Qaeda and I am optimistic that we will defeat the 1% before they are able to effectively counterattack. 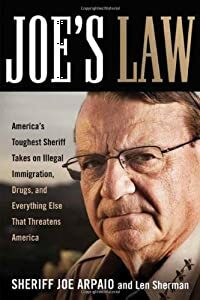 Joe’s Law by Joe Arpaio and Len Sherman is the 2008 autobiography of America’s toughest sheriff with his opinions on drugs, illegal immigration, politicians and everything else that threatens America. Sheriff Joe is the sheriff of Maricopa County which includes Phoenix. He has been elected and re-elected to the position with continuing very high voter approval. He is also quite controversial because of some of his policies. I am not going to discuss that in this posting because I have read only his side of the story. In this posting, I want to discuss his career in drug enforcement which spanned 30 years in the Federal Government. Drug enforcement is dangerous work, but Joe enjoyed the challenge. When he retired, he tried being a travel agent, but missed the challenge and excitement of law enforcement. Then he ran for sheriff and found a new niche that he enjoyed. Most of the book is devoted to his career with the Drug Enforcement Agency and its predecessors. One telling fact, I consider it THE telling fact, drug interceptions into the US were about 10% when he began his career and they were still only about 10% when he ended his career. 30 years and no change. I think it is time to change our focus to the 90% that is not intercepted and enters the US. I have never used recreational drugs nor have I researched the subject, but I intend to research it and will report on my findings. If we able to reduce the demand for drugs, then the suppliers would lose all incentive to smuggle it into the US. Right now we are treating the symptoms of the problem, not the cause(s). Until we focus on the causes, we will never lick the problem which I consider more of a threat to the country than al-Qaeda, Saddam Hussein and a nuclear Iran all rolled into one. Let us list some possible sources of the drug problem: poverty, boredom, lack of parental guidance, lack of leadership by our religious leaders and our politicians, divorce, declining moral standards, corruption in high places, lack of opportunity, inadequate schools, and the list goes on. Until we determine why people use drugs and make the attempt to reduce their incentives for drug use, we will never solve the problem. It will take honesty and courage to face why people use drugs. To date, we have taken the easy way and as Sheriff Joe relates, the easy way has not worked. I would like to add an aside at this point. Sheriff Joe describes his encounters with John McCain in this book on pages 227 through 233. He found John to be bad tempered and vindictive. That confirms my impression from reading other accounts about John McCain that I read before the 2008 election. I admire his contributions to the nation but I thought then and continue to believe now that John McCain was the wrong person at the wrong time to be elected President of the US. We can count our lucky stars that Barack won that election.